What is the weakest point of most hardware keyloggers? Size! 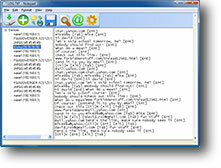 A short glimpse behind the computer will disclose even the most sophisticated keylogger. This has now changed with the KeyGrabber Nano. 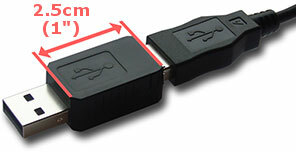 Being only one inch long, this is the first truly stealthy keylogger, not only to software, but also to the human eye. But there's more. The KeyGrabber Nano Wi-Fi contains an embedded Wireless LAN module, enabling it to connect to a Wi-Fi Access Point, and send E-mail reports. You can also connect to the keylogger at any time over TCP/IP and view the captured log. All this at an extremely competitive price! Smallest hardware keylogger on the market: only one inch (2.5 cm) long! 16 megabytes of internal memory! Important note: this product has become obsolete and is no longer in sales. 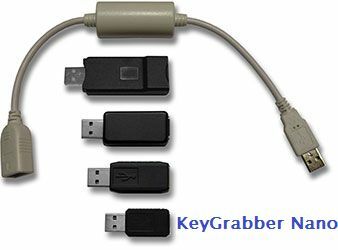 The KeyGrabber Nano series inherits all the features of the standard KeyGrabber USB, with ultra-compact housing, and 16 megabytes of internal memory. Recording keystrokes has never been easier: just plug the keylogger in-between the keyboard and the computer. To view the recorded data, switch the keylogger to Flash Drive mode, and it will pop-up as a removable drive containing a log file. No software or drivers are required. The KeyGrabber Nano Wi-Fi keylogger also incorporates a built-in WLAN transceiver and TCP/IP stack, meaning it can connect to the Internet through a Wi-Fi Access Point. 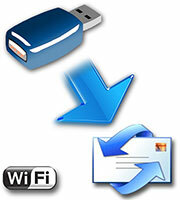 To do that, you must provide it some basic data, such as the Network ID and password (just like any WLAN device). Once connected to an Access Point, the keylogger will start sending E-mail reports with captured keystroke data to any recipient E-mail address you supply. This means you can keep track of what's happening on the monitored computer from any place throughout the world, just by checking your mailbox! 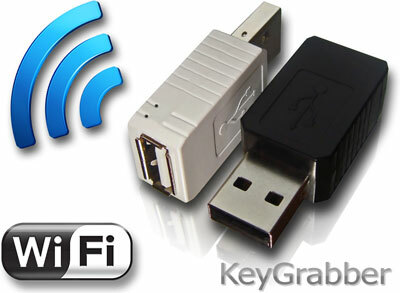 The KeyGrabber Nano Wi-Fi also features a TCP/IP interface, for on-demand access at any time. You can remotely download recorded data from the keylogger, using special software delivered with the device. The control software can communicate with multiple Wi-Fi hardware keyloggers, allowing to create entire networks of wireless keyloggers. 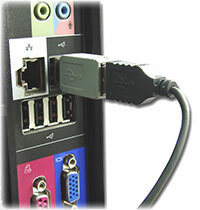 This solution is particularly recommended for monitoring several computers in a household, or controlling employee productivity in companies. If you just need to efficiently monitor a USB keyboard, the standard KeyGrabber Nano is the proper choice. If a wireless network is available, you can take advantage of the KeyGrabber Nano Wi-Fi and access the keylogger remotely over the Internet. Both versions are available for USB keyboards only, with a choice of black and white casing. There is also a enhanced version of this product available, named the KeyGrabber Wi-Fi Premium. This version is available both for USB and PS/2 keyboards, and incorporates 8 gigabytes of memory and a built-in time-tracking module. Technically speaking, you should contact a lawyer to get detailed information about the local laws, and the application for which you intend to use this device for. Generally it's permitted to monitor your own computer, meaning you can watch what your kids and family are doing on the computer. If you want to monitor your employees, or perform any other type of surveillance, you should display a clear notice about this fact. It is obviously NOT LEGAL to use this device for any type spying, or stealing confidential data. Want to learn more? Read the KeyGrabber Nano User's Guide and KeyGrabber Nano Wi-Fi User's Guide, or simply ask us.